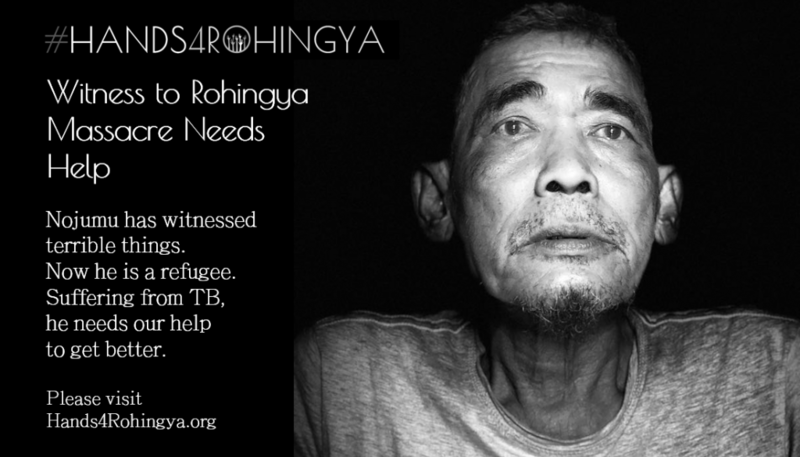 In June 2018 we launched an appeal to assist Nojumu Islam (aka Nazmul), witness to genocide, to help him get better, as he had fallen ill when living in the Rohingya refugee camps in Bangladesh. Nojumu’s story had been reported in the media. He was previously a Buddhist soldier in Myanmar, who had left the military, converted to Islam, married a Rohingya woman and moved to the village of Tula Toli, which was to become the site of the biggest massacre of the Rohingya genocide, taking place on 30th August 2018. Before the military attacked the village of Tula Toli, they removed Nojumu, since they knew he was originally one of them, and took him to their camp where they tried to get him to convert back to Buddhism. From the camp he witnessed the military commit the massacre. He heard a corporal say, ‘We have the order to kill everyone and will kill everyone who disagrees.’ In the days following he smelt the stench of burning bodies. One night when the military had left for a ceremony, he escaped and made his way to Bangladesh where he found his wife and children. They had manged to flee and were living as refugees. In the camps in Bangladesh, Nojumu and his family were left with nothing. Traumatised by what he had witnessed he then fell ill. Through our work with the survivors of the Tula Toli community we had come to know about Nojumu and his family, and had heard that he was not at all well. So we provided some funding for him to visit a clinic to get checked over and buy some medicines to help with his cough. A few weeks later we received a call from his wife Mabia, with a plea for help. Nojumu had returned from the clinic after being told he was too ill to be treated, and at home he had got worse. We felt we must at least try to do something to help this man, a witness to genocide, who had suffered so terribly. So we launched an appeal to help Nojumu get access to treatment, and with your support we were were able to try our best to help Nojumu get better. First we took him to a private clinic (with the assistance of MOAS) where we were able to get Nojumu access to emergency care and a range of tests which revealed that Nojumu was suffering from a severe case of TB. After his release from hospital with TB medications prescribed, we realised that Nojumu would need treating in isolation, so we negotiated the use of a new patch of land near to his family, where we built him a new hut, and laid him a cement floor to try and make it as comfortable as we could. Nojumu’s condition, however, appeared to be deteriorating, so we had his medicines reviewed (by doctors at the Malaysian hospital) and took him for an assessment for malnutrition (at the ACF clinic), from where he was referred to MSF since he was so weak, and from there he was admitted to the MSF hospital. We then arranged someone to stay with him to provide care during the night whilst in the MSF hospital, as he was too ill to leave unattended, and we kept a check on his progress. After his stay in hospital Nojumu returned to reside in his new hut, which we furnished with a new mattress, table and chairs, as well as a solar panel with fan, and we provided a gas stove to help with cooking. We also provided his family with an allowance so that he would not have to worry about his wife and children. We bought additional food to help boost his nutritional intake and also kept a check on his well being. Sadly Nojumu deteriorated further and so we took him back to the MSF hospital where he spent the next days, but sadly died on 11th August 2018. 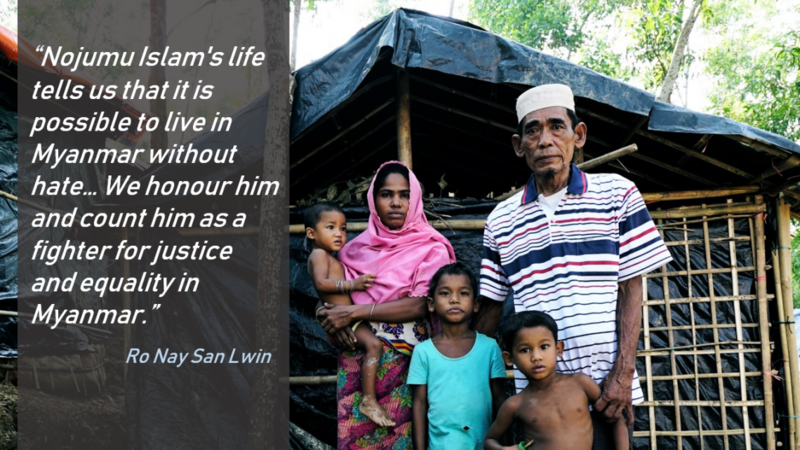 Nojumu leaves behind his wife Mabia and four children living in the refugee camps in Bangladesh, as well children from a previous marriage who are now married and living in Myanmar. Upon his passing, Nojumu’s current wife, Mabia, immediately informed his former wife and children back in Myanmar. We assisted with funeral costs and are now providing some further financial support to assist Mabia and her young children, who have been left with no means to support themselves. 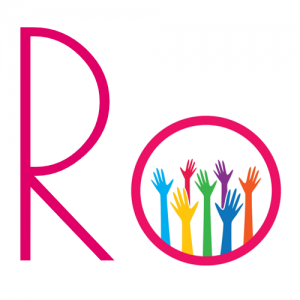 For a full break down of how the funds you donated were spent please click here.